ImageMax technology is specifically designed to read challenging DPM codes on a variety of round, reflective or specular surfaces using a combination of cross polarized and co-linear polarized LEDs and a high powered lens with liquid lens technology. ImageMax technology auto-focuses to read small codes at variable working distances and provides even illumination to reliably read hard to read DPM codes. The one-piece, ESD-safe metal housing simplifies installation and prevents equipment damage. 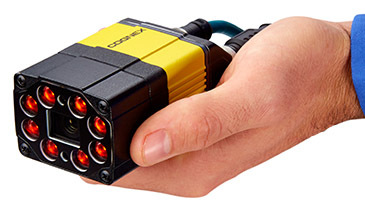 Advanced Control Solutions is a Cognex Datamna 300 distributor in Georgia, Tennessee, Alabama and Mississippi. We offer free evaluations and technical support to help our customers solve their applications.